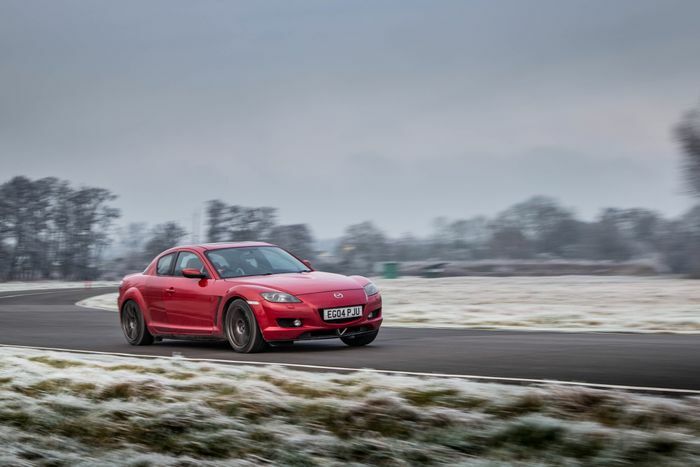 It only takes until about the fourth corner of my first hot lap in ‘Felix’ the Mazda RX-8 to realise that I’m driving it ‘wrong’. Coming straight out of a long succession of modern turbocharged cars with circa-7000rpm redlines and heavy-hitting mid-range torque deliveries, I’m shifting up far too soon. The back end complex of the Curborough Sprint Course, can - and should - all be taken in second with this thing. You simply have to keep the two-rotor engine spinning above 6000rpm, and frequently nudge the 9000rpm redline. And that’s no chore at all. The noise that 13B ‘Renesis’ engine makes is a curious one. It sounds fast and highly strung at almost all engine speeds, not just when you’re headbutting the limiter. And when you are, it’s as though, just for one short moment, you’re thundering down the Mulsanne straight in a 787B racing car. Particularly when you’re driving our ‘Living With A Rotary’ project car, which is tuned to explode a load of unburnt fuel in the exhaust on every upshift. Soon, though, I remember that I’m not on Circuit de la Sarthe, but on a small and tricky little track in Staffordshire. And I need to brake hard and take a tight right-hander if I’m going to have another lap. And I definitely want another lap. And then some. At this point, there’s a slight chirrup from the tyres as the EBC Redstuff pads bite nicely and cause a minor argument with the ABS system, plus a very slight dive at the front end. One very slight movement of my left-hand is all it takes to slide from third into second. 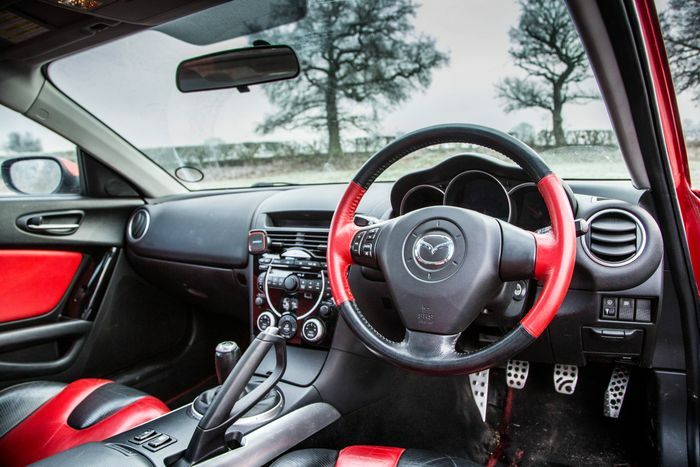 Mazda has a good history with satisfying gear-shifts, doesn’t it? Heavily loaded up, there is a reasonable amount of roll, but not anything like what I expected for a 15-year-old car on stock suspension, and in any case, the body control is tidy - taking too much curb doesn’t result in any sketchy wallowing. It’s keen on the turn in and changes direction fluidly through the next set of bends without a hint of nose-heaviness. The steering doesn’t have that off-centre dartiness which is now the norm for sports cars, but that makes it wholly predictable. It’s plenty fast enough anyway, and heavy in a pleasant way. Along with an abundance of grip from the front end, there’s a surprising amount of traction from the limited-slip differential-equipped rear-end. The ambient temperature is -1 degrees centigrade currently, but from the way this thing is driving right now, you wouldn’t know it. Continental Premium Contact 6 tyres were clearly a good choice, but those boots do have a fine chassis to work with, too. 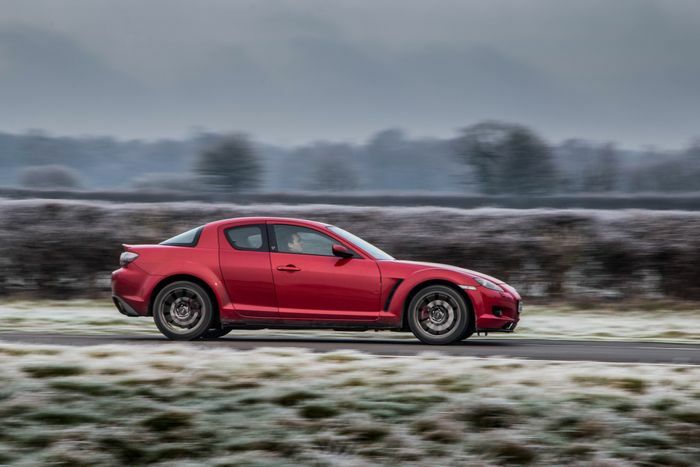 Coming back round to the main straight and feeding in the power, the RX-8 feels quick, but not blindingly fast. Range-topping models were supposed to make almost 230bhp, but even a very well-sorted one will be making more like 210bhp. But this isn’t an engine you enjoy for straight-line performance. 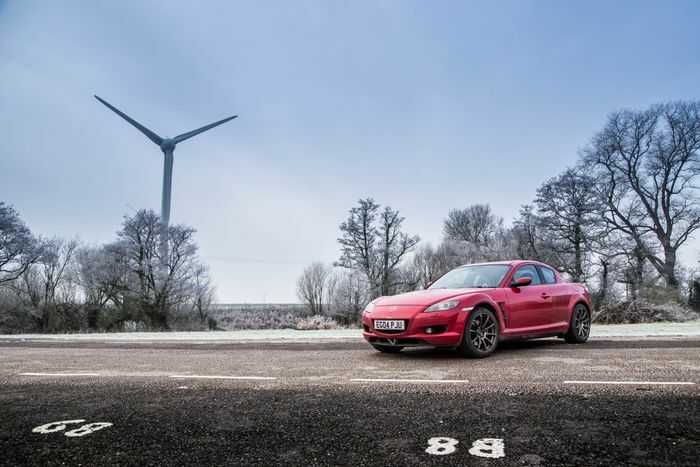 No - it’s all about the incredible responsiveness, the frenzied noise and its eagerness to spin up to the kind of engine speeds few other road cars are capable of. Despite turning up today and assuming that the engine would be the star of the show, however, it’s the chassis that’s impressed me most. It’s so good straight out of the box and in this aged form, it really wouldn’t take much to turn one of these into a track day demon. Understanding why takes a mere look under the bonnet. 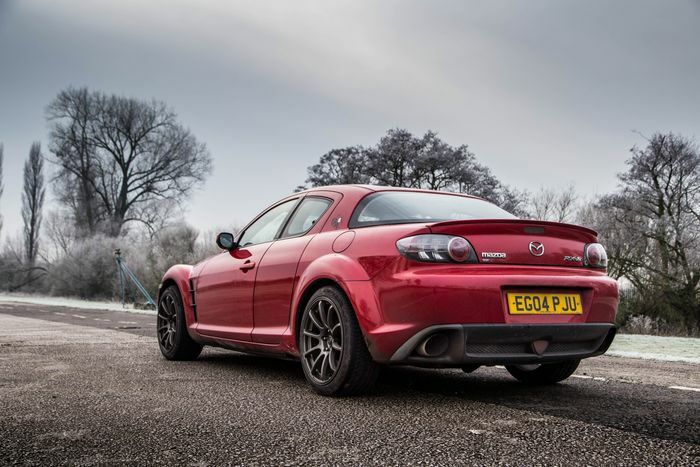 That compact Wankel engine sits super low and comfortably behind the axle, giving a low centre of gravity and a brilliantly balanced front-mid layout. The platform is borrowed from the NC MX-5, and merely lengthened a bit. It’s one hell of a recipe. When you’re getting all of this for £650, you can overlook the fact that the bodywork is a little tatty and that the interior has seen better days. But here’s the catch: this car wasn’t £650. Yes, that’s how much CT video chief Alex bought it for, but the engine was, as we found out, on its last legs and in need of a rebuild. Compression was too low and the main bearing had failed. Two rotor housings, one rotor and much more besides had to be binned. In the end, only a quarter of the original engine was carried over, resulting in a bill of £3500. 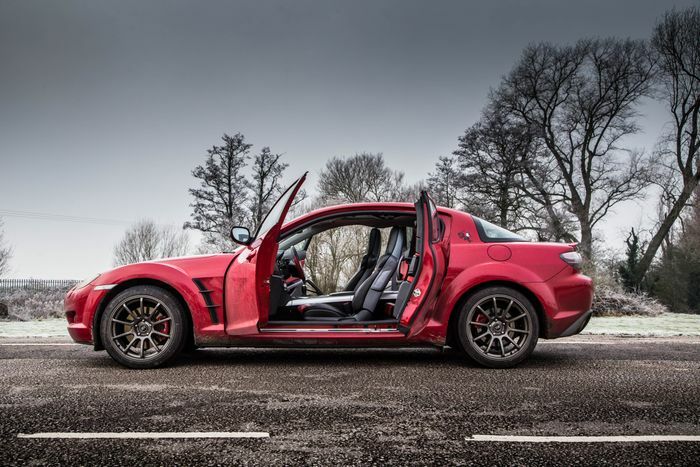 For someone whose spent the last few years looking at those dirt cheap RX-8s you see in the classifieds and thinking ‘what if’, the reality is a little hard to swallow. Like it or not, these are high maintenance engines, and once the prices fall sufficiently, many end up in the hands of less than fastidious owners. They do have plenty of inherent flaws, too, beyond the apex seals people mention almost immediately after you’ve uttered ‘R’, ‘X’ and ‘8’. The 800rpm standard idle, for example, isn’t great for oil supply, meaning many experts will up it to 1000rpm. Then there are the oil injection ports: they point outwards, leaving a middle portion of the rotor and housing that are left under-lubricated. For the ‘last hurrah’ R3 models, a third injector was added in the middle. Yes, you could bag a cheap one and you might just get lucky, but it’s best to assume the Rotary Gods will not be kind to you. Realistically, you have two main options: spend at least £2500 on a tidy one and have a compression test done before handing over the cash, keeping in mind that a rebuild may be needed at some stage. Or, you could buy a cheaper example like Felix for under £1000, have the rebuild done and know you’ll be safe for the next 100,000 or so miles. In other words, there’s no such thing as a cheap RX-8. That is, if you continue to care for it properly. 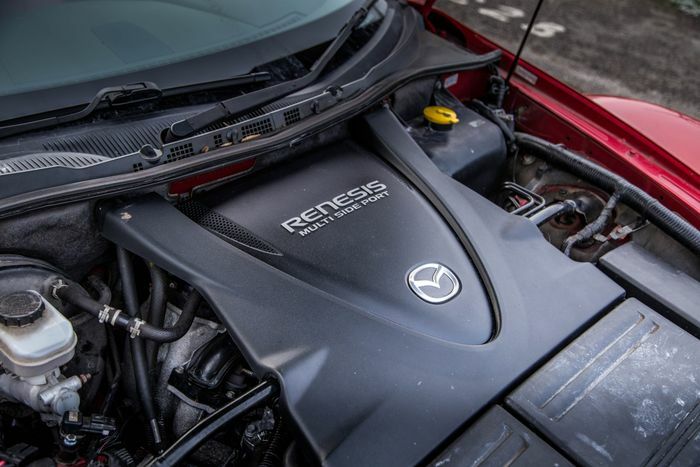 You have to use high octane fuel - and lots of it, such is the RX-8’s ludicrous thirst - remembering to premix with two-stroke oil. It’s absolutely essential to keep a close eye on the oil supply, and only use the right stuff. As an ownership experience, it’s more demanding than a lot of supercars. 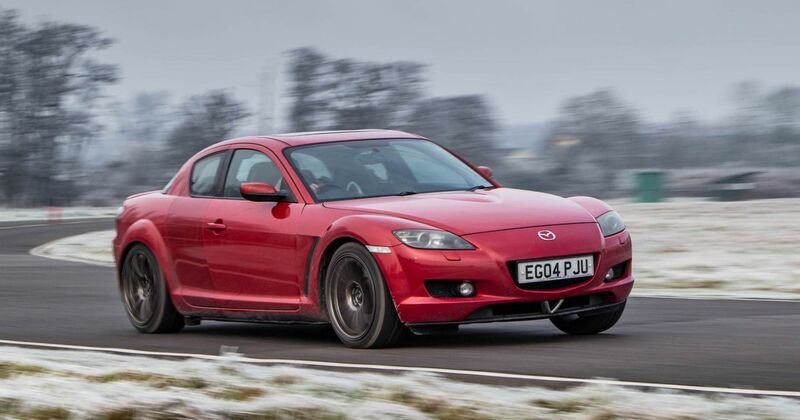 Having now spent some time with one, I can see why many come to the decision that the RX-8 is worth the trouble. I’m just not sure I’m brave enough.